Huge hoardings in Hyderabad city have become a nightmare for all of us. 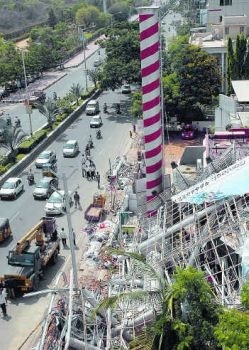 Recent reports of deaths caused by falling hoardings from high buildings and huge poles have forced people look upon them as death traps. The other day a billboard from a six storey shopping mall fell killing a youth on the spot and injuring others. Earlier, on11 April this year, a huge billboard raised on an enormous uni-pole gave way and collapsed on a restaurant and ice-cream parlor. A worker was killed instantly and many others were seriously injured. It completely damaged a couple of cars that were parked on the road and uprooted electric poles and strewed the road with metal pieces, rubbles and cables. I happened to come that way within minutes after the accident. The site looked like a battle zone that was just bombed. The huge billboards that are ubiquitous in Hyderabad city bear witness to the transformation of this city into a big metro that is one of the biggest business centers in India. Most of these huge hoardings have come up in the past two years or so. Municipal corporation authorities often fail to enforce the rules and norms and reign in builders and advertising companies that flout them. Do things like this happen anywhere else? When the news of Saddam Hussein’s capture in a dark hole exploded towards the end of 2003, and humiliating images of his bearded deranged face, and of his jaws opening for medical inspection, were beamed on television, another old man far away felt something turn inside his stomach. Nair was the chief cook at the Basra International Airport between 1982 and 1987, once a heady place where Saddam Hussein used to come for elaborate dinners. During that tenure, Nair’s path had crossed the dictator’s when he made a Tamil snack called bonda, a type of batata vada. Nair remembers that Saddam was so enamoured with the bonda that he asked animated questions about it. Long before that meeting, Nair had considered Saddam a profitable god. “I educated my children, married off my daughter and constructed a house with his money. To be honest, I’m indebted to him for all the comforts that I enjoy today,” Nair says. He lives in a traditional house, that has a cosy purposeful austerity about it, in Kalpati, a Tamil Brahmin village. His gratitude is so immense that when he opened a provisions store in 1989, upon his return from Iraq, he named it Saddam Stores. He sent some pictures of the shop to Saddam Hussein along with a letter in English. I’d worked in your country for five years. I came back to Kerala some two years back. To keep myself busy, today, I opened a small shop at my village. It’s my honour to name the shop after your Supreme Name. Whatever I’m today, it’s because of the salary you paid me. By your blessings, my family is leading a comfortable life. Welfare be with you always. Nair’s friends in Iraq sent him the clippings. The story didn’t end there. Saddam Hussein sent a personal emissary, Muther Ali, to India who met Nair. And the message was conveyed to Nair that Saddam wanted him to return to Iraq. But, when Nair cited age-related problems which forced him to remain at home, Saddam welcomed his children to join him at his palace. Unfortunately, none of them were of employable age then. Eldest son Suresh was studying in the tenth standard, second son Murali was in the eighth and Pusha, the youngest child, was in the fifth. “Saddam conveyed that I was the most loyal citizen of Iraq and the country’s doors would always remain open to me. Ali presented a gold watch and Rs 16,000 in cash,” Nair says, producing the watch from his cupboard’s locker. The timepiece carries Saddam’s picture on the dial. Nair has removed the watch’s battery to save it from the tedium of being in a working condition. “I’m praying for his welfare. Daily, I do archana in his name at the Shiva temple here. I’m certain he will come out unscathed,” Nair says, throwing his hands towards the heavens. When he is confronted with the question why he worships a man who is believed to have killed thousands, Nair flashes an angry look. “Who says…?” he thunders. “It’s the US which is harping on this. I don’t believe a bit of it. Varanasi , the holiest city of the Hindus with an unbroken history of thousands of years, became the latest target of Islamic terrorists on Tuesday, 7th March 2006. The terrorists struck at two places- the first at a temple and the second at a railway station- and triggered three explosions that killed more than 20 innocent people and injured many. The 400 year old temple was teeming with devotees who had come for evening worship when the first bomb went off. This was the third terrorist attack at a Hindu temple in recent years. Muslim terrorists struck at Akshardham temple in Ahmedabad on 25 September 2002, killing 39 people; a six member suicide squad tried to storm the Ramajanmabhoomi temple in Ayodhya on 5 July 2005 and got killed (a woman devotee who had sustained injuries died later). The Varanasi blasts once again show how vulnerable India is. Islamic terrorists can strike at a place of their choice at will. The timing of these latest attacks was calculated to deflate the general mood of self-satisfaction in the Indian establishment prompted by the high profile visit of the U.S. President and the much publicized nuclear deal the two countries have signed. By targeting devotees inside a revered temple in Hinduism’s most sacred pilgrimage center the terrorists have inflicted another deep wound in the Hindu psyche, which will keep aflame animosity towards Muslims in the collective conscience of the Hindus. The Islamic terrorists (controlled by their masters in Pakistan) have proven a point and exposed India’s vulnerability once again. When I was going to city this afternoon, I saw a funeral procession. It was a small procession carrying the dead body of an old person with the accompaniment of percussions. Evidently they were very poor people from a backward settlement in the outskirt of the city. Otherwise the road would have been blocked by the huge procession and numerous vehicles. The funeral procession would have been conducted in great style befitting the status of the dead and the living alike. None of the mourners was waling or weeping. Children were absent and women numbered only two or three. The drummers beat out a disgusting rhythm. I glanced at the corpse on the bier that was resting on the shoulders of the bearers. Wrapped in white shroud till the chin, the head jutting out, the lifeless, stony face with the eyes closed forever, it was like a log of wood to be consigned to flames shortly. Rich or poor, king or commoner, all take the same road in the end.